Are you conflicted? I know I am! But maybe we don't have to be? When faced with a terrible situation are you prepared to make a difficult decision? 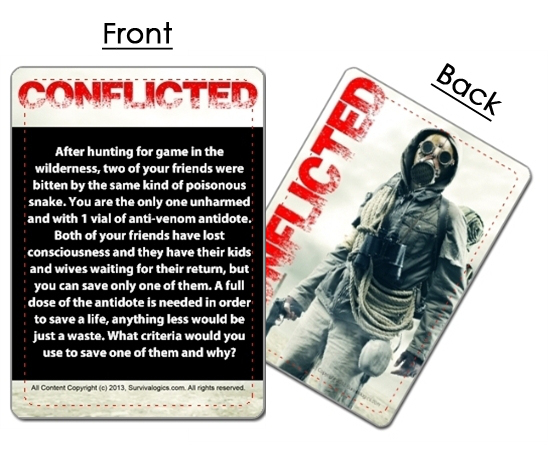 It is obvious to me that Conflicted, the survival card game was created to help us preppers consider what we would do in different situations. Many of the scenarios it presents we most likely have never even thought about before. However unrealistic these situations may be in our lives right now an SHTF slash post-apocalyptic time seems destined to come to pass in our near future. As the rules of the game direct; this scenario is best discussed/played with two or more of your family or other group members. The intended benefits of the game as I see them are learning the perspectives of each person in each situation and then determining your own response before you are faced with the situation. By thinking and talking through these different scenarios it is more likely that you'll be able to come up with the correct outcome for your group. It could also help to better prepare your mind to cope with difficult circumstances. I can also see how playing this game would help me to better get to know the people in my group which could also help to determine the roles they may best fill within the group. After first reading through the game cards I was hesitant to sit down with my family and play the game. I still have young kids and my older kids are teenage daughters. I worry about scaring my kids when I talk about what is coming up in our future, and I occasionally do for which my wife scolds me. Despite my hesitance I gave it try. I started with some of the easier and less shocking scenarios. To my surprise my daughters were not as squeamish as I had anticipated they would be. One of my daughters commented that although the scenes that were painted were generally grim and decisions were difficult her curiosity of what could be done, what the right answer was, was more powerful than her fear. The saying "Knowing is half the battle" is most definitely true. If you already know your response to a particular situation you're half way there. 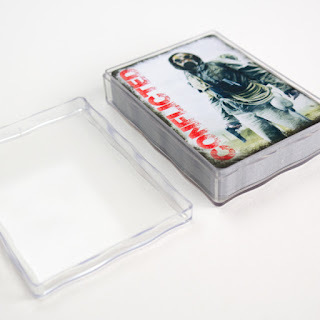 Although there are many more variations of the situations given on these face cards I believe that playing this game will make those other yet undetermined decision more clear and easier to make.